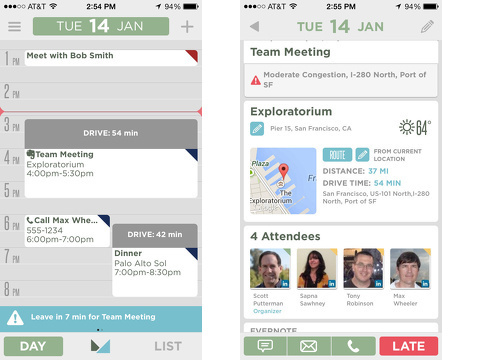 The Mynd iPhone app is a smart calendar with helpful features and simple tools. It uses information gleaned from syncs with your calendar, contacts, reminders, and locations to help you stay on top of business and personal responsibilities. The Mynd iPhone app is loaded with options and is a free download from the iTunes App Store. The Mynd iPhone app requests several permissions to get started. You authorize your calendars, contacts, and locations. You will also want to touch the line icon in the upper left corner of the home screen to add additional services. You can sync your Evernote and LinkedIn accounts. Evernote information will be pushed to you, when it is relevant according to your schedule. When you have appointments scheduled with LinkedIn connections, their profiles will be available with one touch from the home screen. You need to touch the reminders icon on the home screen to authorize reminders. I understand the hesitation to pack too many authorizations prior to showing the home screen, but a pop-up reminder would help users immerse themselves more quickly in the full functionality. The layout of the home screen blends elements of social feeds and old-school, hand-written calendars. Each section of the screen is a shade of yellow, blue, or green. The next event fills the upper left rectangle. The time is boldly displayed, and the smaller title rests under it. The weather details are shared in the upper right corner. Additional squares and rectangles contain people, locations, distance traveled, and reminders. The Mynd experience is concise, clear, and attractive. You can switch to a list view for your calendar with a touch on the list icon at the bottom of the screen. The list is a colorful version of iOS calendar interface. The Mynd iPhone app helps you stay on top of traffic obstacles after a week to understand your routine. You can also add your home and work locations manually from the sliding left menu. To maximize this tool, you should enter address and location details for your meetings and appointments in your calendar. The scheduler tool is awesome. You can select several available times and email them to attendees. All of the times you suggest are temporarily marked in your calendar. After your attendees respond, you touch the desired time. The suggested times are erased from your calendar. 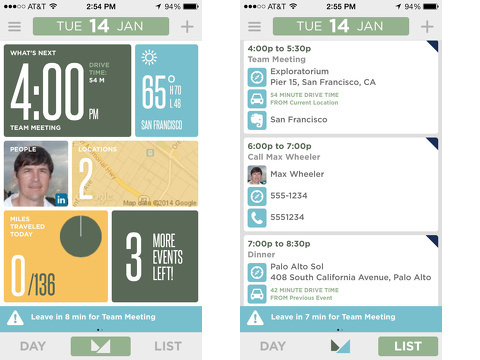 The Mynd iPhone app combines different iOS apps, LinkedIn, and Evernote into a cohesive, well-designed picture of your schedule and responsibilities. AppSafari review of Mynd – Smart Calendar & Meeting Scheduler was written by Jenni Ward on March 25th, 2014 and categorized under App Store, Calendar, Contacts, Enterprise, Free, iPad apps, Productivity, Universal, Utilities. Page viewed 5787 times, 1 so far today. Need help on using these apps? Please read the Help Page. I like apps that keep us organized.